This month we’re looking at two aspects of birds and pets: can the wild birds of your yard become familiar enough to be considered ‘pets’, and are any of your real pets, dogs and cats, at risk around SaddleBrooke’s wild birds? If you provide food for birds, hang hummingbird feeders or set out seed, eventually you will probably recognize individual birds through an errant feather or other distinguishing mark. Those birds probably recognize you as well, and although they’re never likely to play ‘fetch’, you may well establish some level of relationship. In the fascinating book, Wesley the Owl, biologist Stacey O’Brien adopted an infant, injured Barn Owl that became her pet for 19 years. Wesley’s injury prevented his return to the wild, and Stacey’s dedication to the owl included purchasing and providing him with 28,000 mice over his lifetime. Think about that the next time you shop for dog food. Other books of interest about wild birds as ‘pets’, include Hummingbirds: My Winter Guests, Providence of a Sparrow and Quail in My Bed. In our case, we have had multiple ‘relationships’ with some of our yard birds. Gray Head, so-called because of his unique gray head feathers, is a male Hooded Oriole that visits us each September on his southbound migration back to Mexico. In 2010, he forgot to leave or maybe was worried about reports of violence south of the border. 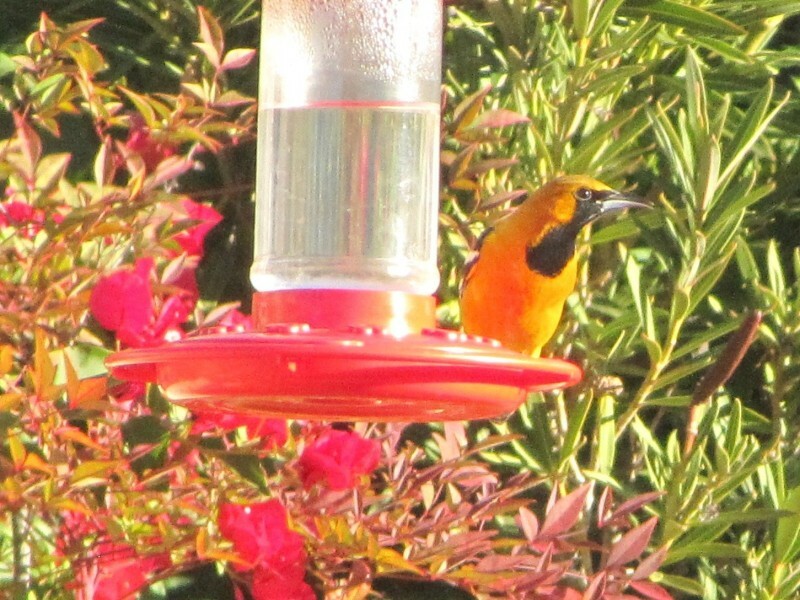 In any case, he came to our hummingbird feeders daily from September into the following March, when other Hooded Orioles began showing up on their northern migration. An over-wintering oriole is not unheard of in Arizona, but it is extremely unusual, particularly considering that the winter of 2010-2011 was one of the coldest on record. 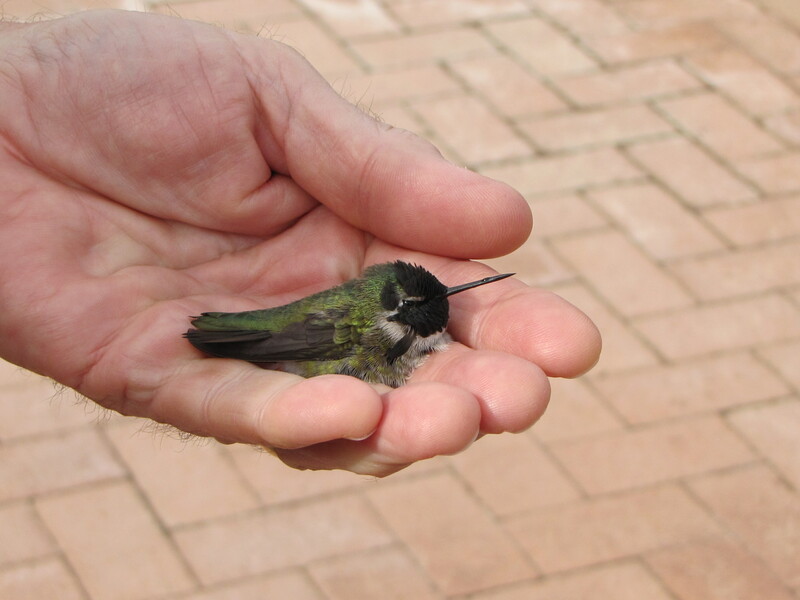 One of our all-time favorite wild bird ‘pets’ is Lazarus, a male Costa’s Hummingbird that we found on our back patio one December morning, an apparent victim of a brutally cold night. As I carried him to a suitable final resting place, I noticed a leg quiver on his still warm body. We swaddled him in a heated shoe box and watched him gradually return to the living. 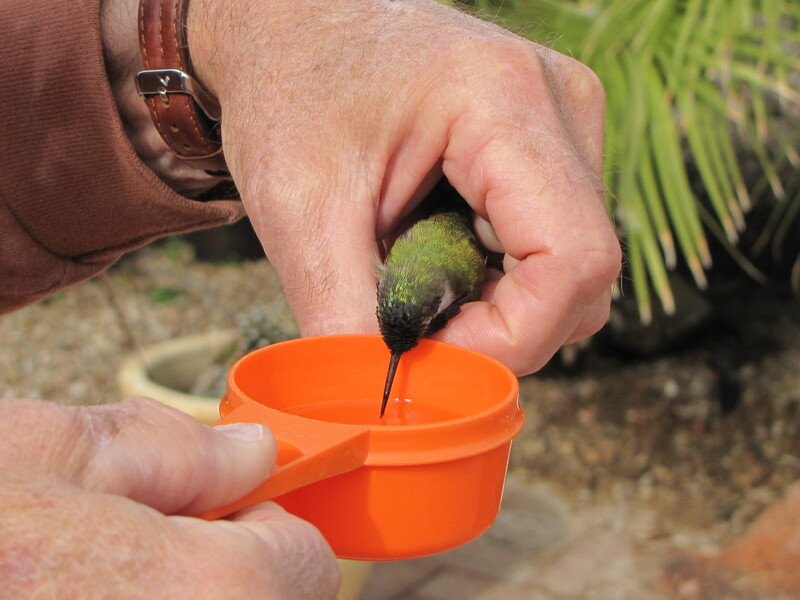 Three days later, after hourly feedings of sugar water, Lazarus left my hand and flew away. That evening, while we sipped wine on our upper patio, a male Costa’s buzzed in and hovered in front of us for a full minute. A recognizable cockeyed gorget feather proved it was Lazarus. We weren’t sure if he was thanking us for the sugar water or asking for a slug of Chardonnay, but we’re certain he’s still a regular visitor. None of our countless quail or doves has ever become a ‘pet’, but this is probably because they see Gary and James Fennimore as pet-like regulars at our house. Gary and James Fennimore are a pair of Cooper’s Hawks that view our bird-rich feeders as their own private smorgasbord. They are particularly fond of plump Mourning Doves, not the brightest bird on the block, and love to drive them into windows. After retrieving the stunned doves, the Cooper’s take a leisurely meal on our stucco walls or patio furniture. No wonder the doves refuse to fetch the paper. Which brings me to the question, are birds a threat to real pets? Those Cooper’s Hawks and their smaller cousins, the Sharp-shinned Hawks have an appetite for birds, but even small cats and dogs are just too much for them. 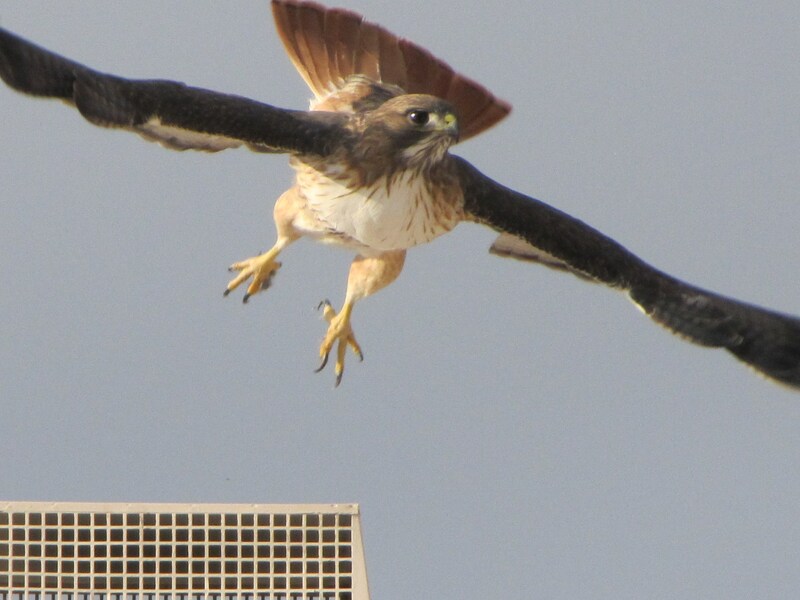 On the other hand, larger raptors like Red-tailed and Harris’s Hawks and Great Horned Owls are meat-eaters with bigger appetites and talons to match. All three of these birds will eat mammals as large as rabbits. Your German Shepard has nothing to fear, but if your Chihuahua weighs less than 10 pounds, I would keep him on a short leash. And if your pet likes carrots and has a fluffy white tail, you might want to carry him on his daily walk. 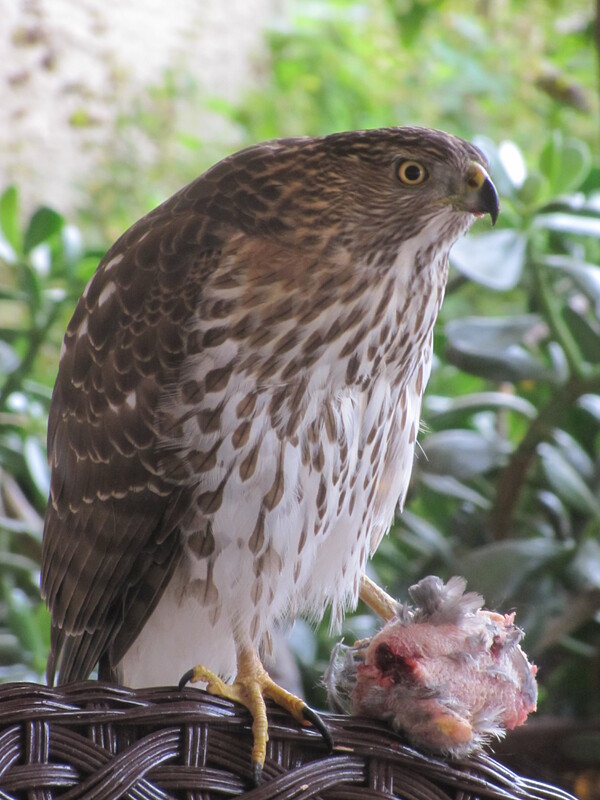 This entry was posted in Birding Arizona and tagged birds as threats to pets, Cooper's Hawk, Costa's Hummingbird, Hooded Oriole, Red-tailed Hawk, Wild bird pets. Bookmark the permalink.